The global operation support system (OSS) and business support system (BSS) system and platform market is poised to witness lucrative growth opportunity in the forthcoming years, according to Transparency Market Research (TMR). The report states that the top five market players hold approximately 40% of the overall market share in 2015, indicating towards a highly fragmented landscape. The prominent vendors in the global OSS BSS system and platform market are Accenture Plc, Nokia Siemens, Amdocs, Hewlett-Packard Company, and Telefonaktiebolaget LM Ericsson (publ). The leading players are anticipated to focus on expanding to emerging economies, in order to tap into the vast potential of these regions. Players are increasingly forming alliances with mobile network operators to gain a competitive edge. Vendors are updating their products, such as ensuring that their product is equipped with new technological innovations such as service delivery platforms, in order to create an advanced and differentiated product portfolio to gain a thrust in the global OSS BSS system and platform market. 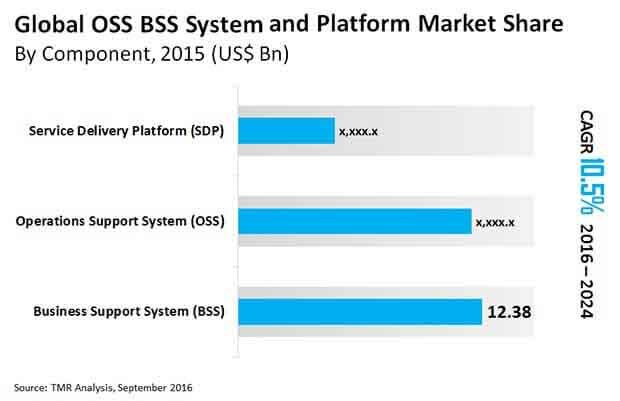 The global OSS BSS system and platform market was evaluated to be at US$29.11 bn in 2015. With a robust 10.5% CAGR, the market is predicted to clock in a revenue of US$70.97 bn between 2015 and 2024, the duration of forecast. Based on the type of component, the OSS segment is expected to account for a substantial market share by the end of 2024. The rise of the segment could be ascribed to the dire need for matching the service quality levels in the telecommunication sector along with demand for high speed internet in economically developed regions such has Europe and North America. Considering geographical segmentation, North America is predicted to witness burgeoning demand for OSS BSS system and platforms, propelling the region to the lead. The dominance of this region could also be on account of the presence of prominent MNOs and telecom service providers. Operations Support System (OSS) and Business Support System (BSS), are largely used by communication service providers for service fulfillment, service assurance, customer service and billing. There has been a substantial change in the service providers’ offerings owing to technological innovations and data management. The steady virtualization of network components coupled with software-defined networks are allowing service provider networks to seek new solutions. The emergence of technologies such as 3G, 4G and LTE is impelling the CSP’s to offer wireless, VoIP and a number of similar services all consumer devices and different businesses. These functionalities used by communication service providers, particularly OSS and BSS for is expected to augment the demand for OSS and BSS over the years to come. Cloud OSS BSS is a combination of both capabilities and deploying them through cloud. Cloud OSS BSS aids the operators in catering to the customer requirement through a service eco-system and transforming infrastructure and bring life to software defined networking. The systems are typically built using a platform driven approach consisting of common software components for deployment through cloud. This helps in the realization of a single IT environment that consists of all OSS and BSS applications, stored in central database. Cloud OSS BSS leads to a digital transformation of the business at a technological as well as organizational level. This is a key trend emerging in the global OSS BSS system and platform market, fuelling market growth to a great extent.